On arrival you we'll discuss the route of your flight and then there will be a short pre-flight briefing on the flight. Then we will fix you up with a flying suit, helmet and intercom headset, and get you securely strapped into the aircraft. After carrying out full pre-flight safety checks, we'll taxy out onto the runway. Depending on the flight conditions, if you wish you will get the chance to have a go at flying the aircraft from the back seat, using the student training bars fitted to the control frame. Depending on where you live we may be able to take a look at your home town or village from the air. This trial lesson or 'air experience flight' is actually the first step to getting a licence should you wish to continue. 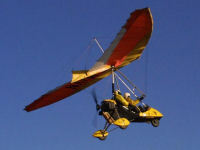 It is Flight Exercise 3 from the British Microlight Aircraft Association (BMAA) Syllabus of Microlight Pilot Training. Like the earliest pioneers of powered flight, you will experience for yourself the sensation of an open-cockpit flight in a small aircraft. The microlight flies at around 45-60 mph although the sensation of speed is very different to being in a car or on a bike. All the equipment you need for your trial flight - flying suit, gloves, helmet and intercom headset - will be provided. People with physical disabilities can also fly, depending on the nature of the disability and providing they are able - with the help of a relative or carer where necessary - to be seated comfortably and securely in the aircraft. Check with us if you're not sure. Please note that flight times are calculated from engine start to engine stop, so they include engine warm-up, pre-takeoff checks and taxying to and from the runway. If weather conditions are not conducive to flying, we'll simply re-book your flight. Stratford upon Avon, Warwickshire, CV37 8LL.